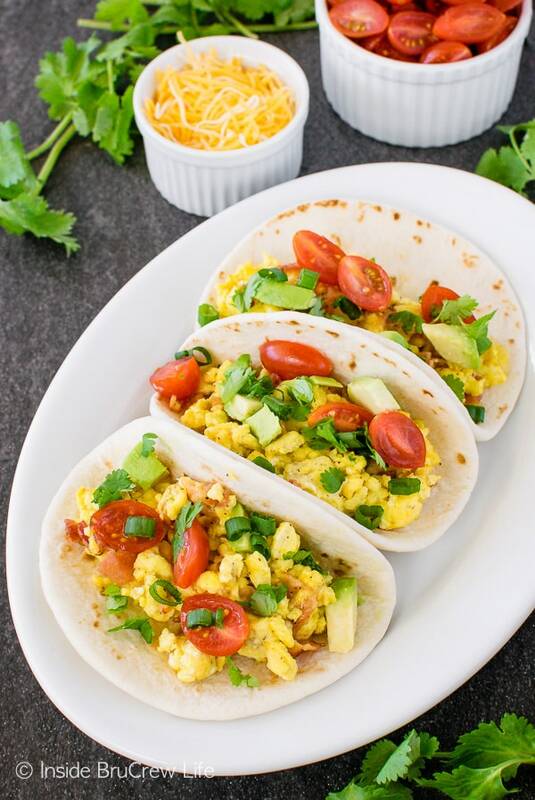 These easy Bacon Egg Breakfast Tacos are a delicious and healthy way to start out the morning. 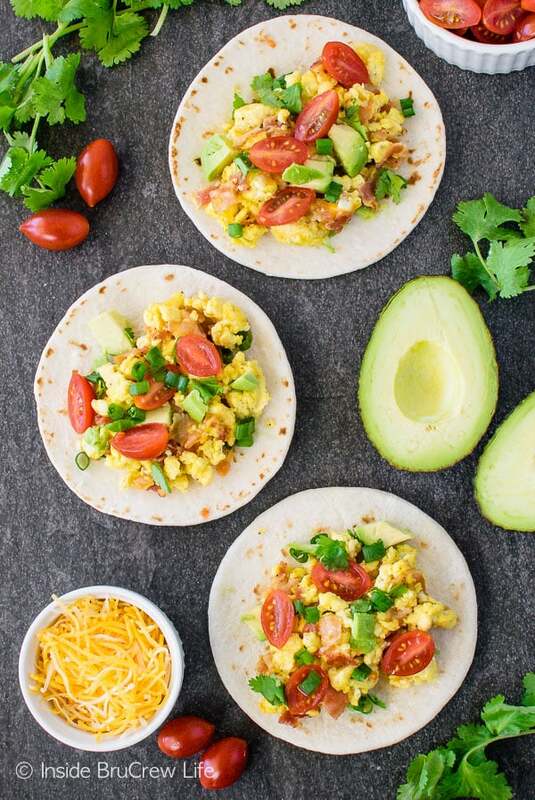 Save time by making the eggs the day before and keeping them in containers in the refrigerator for quick and easy breakfasts. We are officially back on the healthy eating train. It’s a ride we frequently get on and off throughout the year. I am happy to say that I have stayed fairly consistent for the past year with eating and exercise. Through the holidays I took a little break but only gained about 4 pounds. Hitting it hard at the beginning of the year made it easy to get rid of those extra few pounds. My hubby has not had as much luck as me. Last year through the summer he worked out and ate right, so that when we did our Tough Mudder he was looking pretty shredded. Then through the holidays he stopped working out as much and ate all the things he could find. 20 pounds later he has decided to dive back onto that healthy eating train. He was comparing pictures from October and February the other night, and we couldn’t believe the difference in just a few months time. It always amazes me how quickly our bodies can gain weight when we stop watching our food intake carefully. Needless to say, he has a goal of losing those extra pounds, so this week starts the healthy eating. Plus, a trip to the tropics in a few weeks is always a good motivator. One thing that we eat regularly when we are watching what we eat are eggs. Usually I will make a pan of this broccoli and cheese egg casserole to have in the fridge for mornings, but this week I was feeling like tacos. It was the bag of little 4-inch street tacos that did it to me. I was walking through Walmart minding my business and right across from the eggs was a stand with these cute little shells. At that moment I wasn’t really sure what I was going to make. My first thought was baby quesadillas for the kids. I just knew I had to buy the baby tortilla shells right then and there. The bag of tortillas sat on the counter for a few days before I decided they were a great size for breakfast tacos. Now if you are cutting carbs like my hubby, you can just skip the flour shell and make a scrambled egg bowl. Either way tastes pretty delicious! I like to add a little bit of water to my eggs before I scramble them in butter. 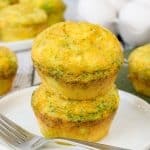 The water and whisking the eggs makes them lighter and fluffier and scrambling them in butter adds a little more flavor. Use a wooden spoon or nonstick spatula to move the eggs around as they are cooking. After the eggs are set, remove them from the heat and stir in the cheese and bacon. While everything is getting all melty and cheesy, chop up your veggies. To save time in the morning, I like to prep everything the day before. You can divide the eggs into 8 small ziplock baggies for easy reheating. Chop the veggies ahead and use little containers to store them in the refrigerator. If you cut your avocado early, make sure to give it a quick brush with lemon juice and keep it in a very tightly sealed container to keep it from going brown overnight. 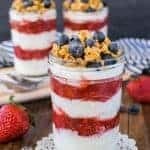 Then in the morning, breakfast is quick and easy to get on the table. 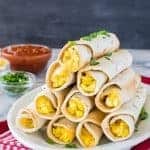 Having everything ready ahead of time for these bacon egg breakfast tacos keeps me from being lazy in the morning and grabbing the Nutella pop tarts I made for the kids. 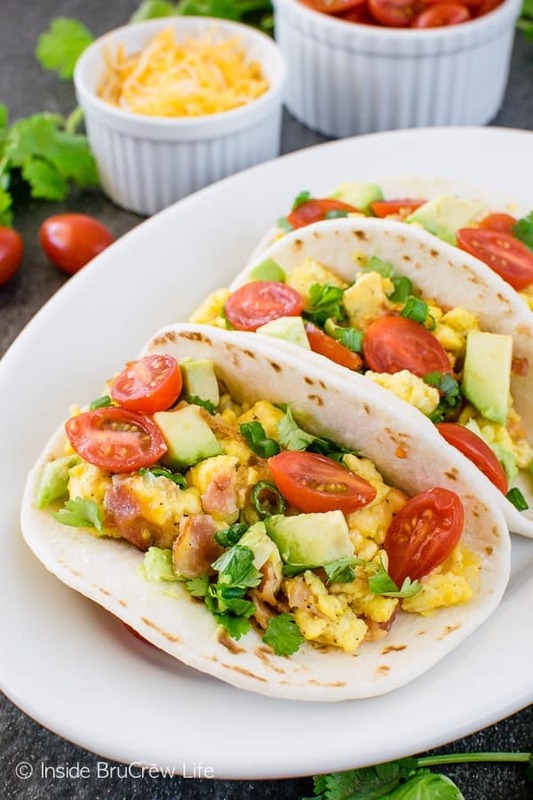 These easy Bacon Egg Breakfast Tacos are a delicious and healthy way to start out the morning. 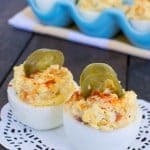 Save time by making the eggs the day before and keeping them in containers in the refrigerator. Whisk together the eggs and water. Pour into prepared pan and fry eggs until set, stirring often. Season with salt and pepper. Stir in the cheese and bacon. Cover until melted. 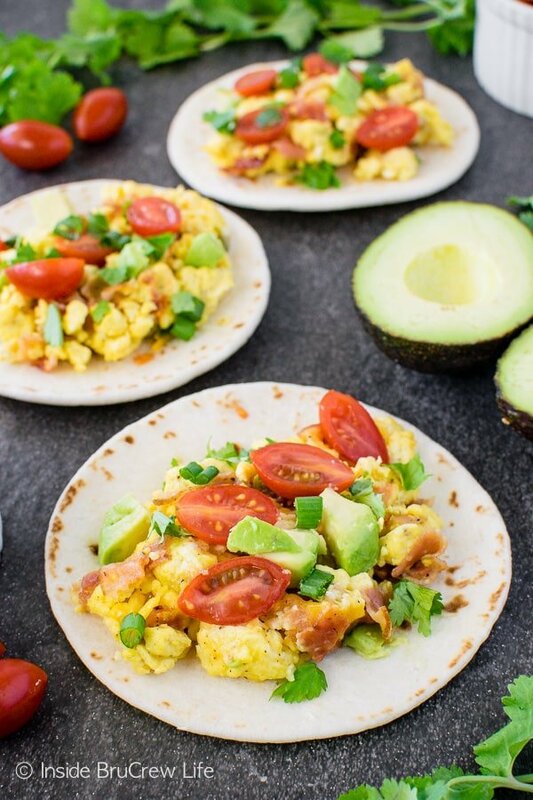 Top each tortilla with eggs, onion, tomatoes, avocado, and cilantro. Serve immediately. Dang, i’m sure he’ll shed them quickly, guys have that ability it seems! 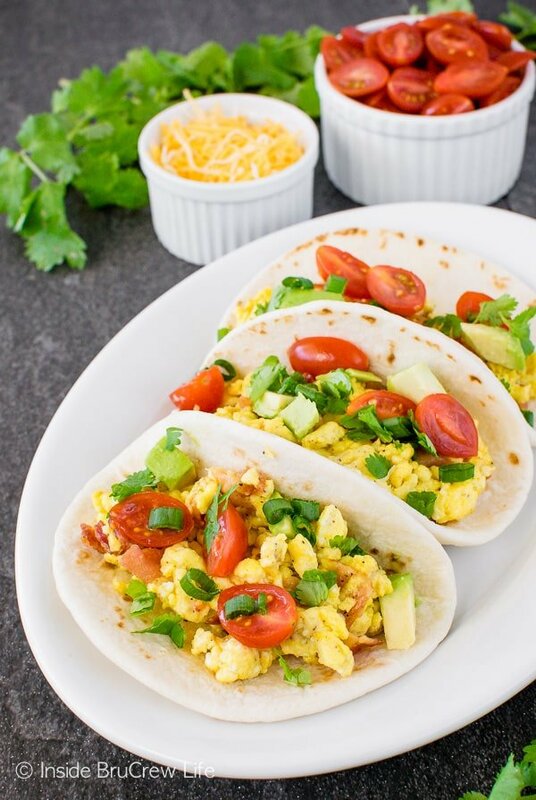 And these tacos look amazing, my kids would devour them! It’s difficult to notice weight gain as it comes on slowly. 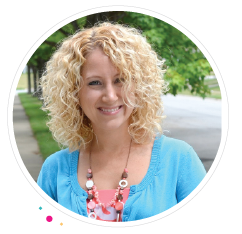 Just like your husband, I only noticed a big change in my body by comparing photos, Jocelyn. I’ve always believed I was lean, but three years back, I started eating healthy. Then when I looked back at the photos before I starting eating better, I noticed very clearly I had a bulging belly which I don’t have anymore. At that time, I had no idea I had one. I like your tacos. The protein from the egg and bacon will keep me full until at least lunch time. The fat from butter and avocado is good for us. It’s a healthy breakfast. 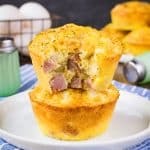 why can the recipe for hamcheese and egg muffins just not appear right away. I have clicked everything I know and still haven’t gotten anything. 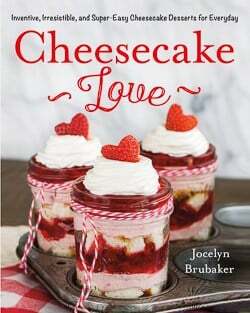 but pictures , no recipe. 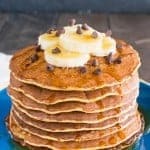 If you scroll down below the pictures there is a printable recipe card.